We believe that there are companies that would gladly support a motivational program that inspires and challenges students in their hometowns and that points them to possible careers in local industry and manufacturing IF they knew the program existed. We are doing just that, and invite you to join us. Brave Enough To Fail Inc, is a 501 ( C ) 3 nonprofit. Our mission is to raise student achievement by providing free motivational presentations and scholarships to schools nationwide, and then point those inspired and motivated young people toward rewarding careers at great companies like yours. Contact me, Wayne Winsley, Executive Director of Brave Enough To Fail inc. to learn how your company can help develop tomorrow’s workforce today by sponsoring scholarships, materials, and school presentations. This article was written by Peter G. Martin, Ph.D., vice president, business value solutions, Schneider Electric. There has been considerable discussion of late about the mass retirements of baby boomers from the industrial workforce and the lack of appropriate talent to fill the gap. Many baby boomers believe that the younger generation—the millennial generation—is not up to the task and that young people have no interest in taking on the challenges. I believe the millennials are up to the task, but unfortunately I have to agree that they do not appear to have the interest. I have noticed some very positive attributes of the millennials that align with the requirements of industry. They tend to be very altruistic. They are as technically savvy as any generation ever has been. They tend to like collaboration and are very comfortable with social media. All of these attributes are exactly what is needed in industry at this point in time. It is up to the soon-retiring workforce to recognize and capitalize on these attributes as the younger generation is assimilated into the industrial workforce. 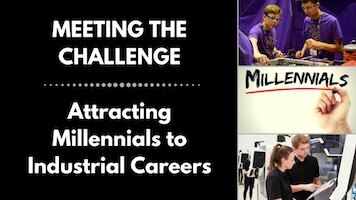 The challenge of the lack of interest in industrial careers by millennials is much more daunting. Members of the younger generation who have a competency in STEM (science, technology, engineering, and math) seem to have a negative perspective of careers in industry. They see industrial careers as undesirable, dirty, and lower-tech and would much rather pursue careers in video-game software development. Perhaps the solution to this challenge is focusing on the “altruistic attribute” of millennials. Millennials seem to desire careers that truly have a positive impact on the world. Industrial production is the key to solving many of the most challenging problems humankind is facing. It is through industry and industrial automation that world problems regarding energy, clean water, hunger, housing, and health can be improved and—in some cases—solved. What young idealistic person would not want to be part of that? Additionally, although in the past a number of industrial practices negatively affected the environment, today industry is seriously taking on the challenge and succeeding at cleaning the environment. It is up to us, those currently engaged in industrial careers, to start reaching out to millennials to share our accomplishments and the improvement potential. With the effective use of automation technologies over the past three decades, careers in industry and industrial automation are as high-technology as any in the world. And the technology deployed in industry does real work to improve the condition of the world. Additionally, most industrial work environments are considerably nicer than young students believe, and with the further application of technology these environments will continue improving. Engineers, as a group, tend to be among the most self-critical people I know. Sometimes we get so wrapped up in daily challenges that we forget to take a step back and look at the importance of what we have done and continue to do. Engineers are problem solvers. We have taken on some of the biggest problems society has encountered and developed very effective and clever solutions. We need to remember and communicate our contributions to the millennial generation. We must get them to understand the importance of what we do, so they will join us and produce even greater outcomes. ISA; the Automation Federation; the Measurement, Control and Automation Association (MCAA); and others have joined to lead the effort of educating young students about the value of careers in industry and industrial automation. In fact, MCAA recently developed some videos to distribute to colleges and high schools across the globe with the intention of encouraging students to consider industrial careers. These are on the MCAA website. We need to continue and advance the great progress that has been realized, but can only accomplish if the most talented STEM students coming through the school system join the cause. Let’s start talking up what we have done, what we continue to do, and what the next generation of industrial automation professionals have the potential to accomplish. Humankind is depending on us. Peter G. Martin, Ph.D., is vice president of business value solutions for Schneider Electric. He holds multiple patents, including patents for dynamic performance measures, real-time activity-based costing, closed-loop business control, and asset and resource modeling. He authored or co-authored four books, most recently The Value of Automation. Martin received an ISA Life Achievement Award. A version of this article originally was published at InTech magazine. Contact Wayne Winsley, Executive Director of Brave Enough To Fail inc. to learn how your company can help develop tomorrow’s workforce today. Founder & Executive Director of Brave Enough To Fail Inc.
At age 14, I was living in an orphanage in Cleveland Ohio, had failed eighth grade the previous year, and basically given up on school. I was a poor black kid who, the experts would say, had given up on my future and was too set in my ways to be motivated to change. I was destined for one of two places, behind bars or dead. I know first hand that even without intention, a word can change a child’s life. That is why I’ve dedicated the rest of my life to delivering a message of inspiration and motivation to as many young people as possible through my organization. Brave Enough to Fail Inc. is a 501 (C) 3 nonprofit that provides motivational programs and scholarships to high schools. The mission is to raise student achievement by inspiring kids with the courage to achieve their dreams and to help students see their education as a way to get what they want from life. To narrow the education achievement gap by focusing on the student end of the equation with a message of courage, hard work, self-discipline, and determination. High schools nationwide are requesting this message for their students. Rather than saying, “No we can’t help you.” We are taking a leap of faith and committing to raising the funds needed to deliver the message to the thousands of students at these schools that, Their Dreams Are Important And Achievable! There are other young people out there who just like I was, are one positive message away from overcoming the poverty, prejudice, and adversity that is standing between them and achieving a better life for themselves. Is there at least one corporation in this great nation that would like their brand to be known for motivating and inspiring youth across America? Are there fellow citizens willing to sow seeds of success into the youth of our communities? If you are that citizen, please make a donation here. Crest High School, Shelby NC. Cathedral High School, New York NY. Urban Assembly of Media Studies, New York NY. Briar Woods High School, Ashburn VA. Integrated Arts Academy, Chaska MN. What is we can help reduce the number of unruly students needing punishment by increasing the number of students who are more likely to be engaged contributors to the class? Joe Cirasuolo, the Executive Director of the Connecticut Association of Public School Superintendents and former superintendent in both the Clinton and Wallingford school districts, recently told The Politic that Engaged students learn better. We agree, and the impact on the overall learning environment is huge. One disengaged and unmotivated student can become a disruption that negatively impacts the learning experience of the entire class. Leading of course, to possible suspension of the disengaged student who only becomes further removed from the education process. On the other hand, if that student is is engaged and truly sees his or her education as key to getting what THEY want, the positive impact on the learning experience of the entire class is no less substantial. That positive impact extends into lower suspension rates and higher student achievement scores. Motivating students with the courage to see their dreams as valuable and worth while, and their education as a way to make those dreams come true can be a very valuable tool in effort to decrease the number of student suspensions. Please give. Your donation today could change the destiny of a child. When I heard those words spoken by the father of my best friend, I was a fourteen year old black kid wandering the streets of Cleveland Ohio. I was a repeat eighth grader who hadn’t attended school regularly for a year. Statistically I was too old to be reachable and was on a one-way path to either a prison cell or a cemetery plot. But that simple message helped motivate me to make better choices and have the courage to follow my dreams. I managed to get an education, even in the substandard inner city schools that I attended, and become a productive citizen in the country that I love. After serving in the United States Navy, I enjoyed a fantastic 20 year career as a radio newscaster and talk show host, ran for U.S. Congress, and now I am a teacher inspiring and educating my middle school students. That is how I know that on any given day the right message, from the right person, can change the trajectory of a child’s life. That is why I am convinced that we can break the cycles of poor achievement and poverty for many of our young people here in Connecticut. There are more than 206,000 students in Connecticut public schools who are classified as poor, based on their family’s income level. We are reaching out help some of those students to help themselves. Our mission is to help change those numbers for the better. The Tauck Family Foundation, a private foundation that invests in the development of children from low-income families in Bridgeport, reports that students in low-performing schools are five times more likely to drop out of high school than those in high-performing schools. One high school in Stamford has nearly 200 repeat freshmen who are high risk to drop out. Our goal is to inspire those students not to give up on themselves. We will be a lifeline of motivation and resources that these students can hold onto over the next four years to help pull themselves out and over their circumstances and fulfill their dreams. We are also launching leadership programs for students as young as 4th and 5th grade. Our children can’t wait for the grownups to to get their act together. The decision of Connecticut Coalition for Justice in Education Funding v. Rell came over 10 years after the case was brought to court in 2005. The appeal could take even longer and after that, the politicians have to fight about exactly how to go about helping the children caught on the wrong side of the achievement gap. How many years will that take? What about the thousands and thousands of children struggling in our failing schools now? Far too many of our young people are leaving poor school systems unable to break the cycle of poverty and ending up in prison or in the social services safety net. Can our student motivational program save every student? Of course not. But can it save SOME students by inspiring them with the courage and determination to overcome the odds and succeed even in so-called failing school systems? Is saving the future of even a few of these children worth the effort? Is it worth doing? If your answer is yes, please give as much as you can right now. Your donation could literally change the destiny of a child. Executive Director, Brave Enough to Fail Inc.